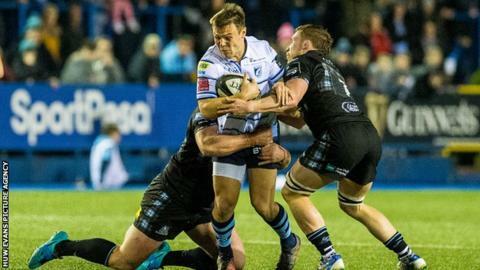 Wales international Jarrod Evans is the latest player to sign a new contract to remain at Cardiff Arms Park. The young fly-half, who made his regional debut in 2015, has made 58 appearances for his home region. Evans was called up by Wales for the Autumn Tests and made his international debut against Scotland in November. "This is my home region and I'm obviously really happy here, so it was a simple decision to put pen to paper... It's an exciting place to be." "Jarrod is one of the best attacking fly-halves in Europe and works really hard, both on and off the pitch, to be the best version of himself," Blues coach John Mulvihill added. "He's an important member of our squad and it's great to secure his services on a long-term contract. I'm looking forward to working with Jarrod to help him become a world class 10 in the future."